My latest green beauty buys – includes natural sunscreens SPF50! 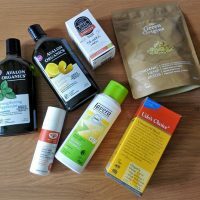 In the past month or two I’ve bought quite few natural beauty products and I thought I would share these here with you. Some of the products I bought were on offer (hence the reason why I bought them) and others I actually needed. See what I bought and why below. 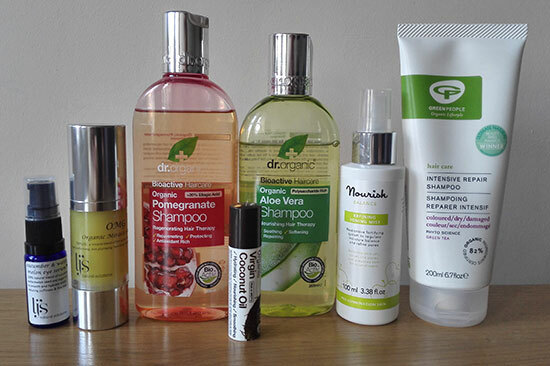 Holland & Barrett were doing buy one get one half price on everything so I decided to buy these shampoos from Dr. Organic as I haven’t tried them before. I always love trying new shampoos to see whether I can find something better from what I tried previously. As you can see on the picture I’ve already started using these. 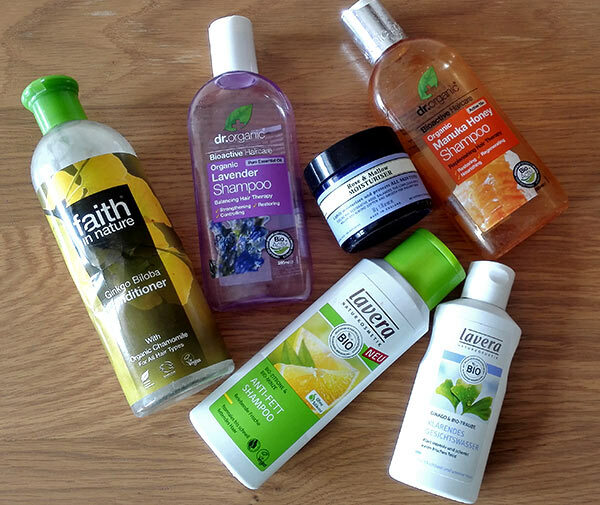 I’ve tried them both but I still prefer Dr. Organic Lavender Shampoo which I wrote about it previously; not to mention one of my favourite natural shampoos, Lavera Lemon & Mint Balance Shampoo, and another of my favourites, Neem Shampoo from A. Vogel. These are definitely my favourite natural shampoos from all that I’ve tried and these new shampoos from Dr. Organic are not changing my mind. I bought this lip balm since I don’t have a balm with SPF and this is something I need, especially in summer. The balm has a lovely coconutty scent and it’s really hydrating. I quite like it but I just need to remember to apply it when I am in the sun! I bought this shampoo from Green People before I bought those shampoos from Dr. Organic. I bought it because I noticed more split ends in my hair and ends were also feeling quite dry. I should really have a haircut but I always have it in Slovenia so I thought this could help my hair repair a bit until my holiday in Slovenia. Green People Intensive Repair Shampoo is actually not suitable for hair which gets greasy quickly (my hair! ), as I quickly found out – I noticed my hair wasn’t staying fresh for very long. This shampoo works though – it leaves hair nice, soft and manageable and I could compare it with the Hairjuice shampoo from DGJ Organics, only that is more natural. I was actually quite excited after I used it for the first time as I was really impressed with the results. The only issue is that it makes hair go greasy quicker so it’s not something I would use all the time, only once a week. However, if you have dry hair, in need of some TLC, then this shampoo is something I do recommend. I needed a new toner and I decided to go for Balance Refining Toning Mist from Nourish as I haven’t tried any of their toners before. I did come across the brand before and tried their face cream samples so I already knew they were pretty good brand. The toner is 97% organic and is fortified with a special vitamin and mineral blend to support skin’s natural metabolism. This is one of the reasons why I bought it – I haven’t tried a toner with a vitamin and mineral blend before. It’s quite refreshing but I wouldn’t say it’s hydrating. I decided to buy full size versions of these products after I tried samples first. I was introduced to this brand by Sandra from Beauty Balm and this is a brand you should definitely check out. Their products contain organic ingredients and are all handmade, most importantly they work! Highly recommended. I will write more about them in a separate post. Neal’s Yard Remedies is a brand I love, I love their ethos and what they stand for and I always like to promote them on my blog. In the past few years I tried quite few of their products, face moisturisers in particular, and most of them were really good. If you haven’t tried any of their health and beauty products yet, now it’s the right time as they actually have summer sales on – I wrote about it previously and you can check what’s on offer here. Recently I decided to buy their Geranium & Orange Soap since I’ve never tried any of their soaps before and I love a good bar of natural soap – I always use soaps for my shower, never shower gels. This gorgeously scented soap leathers really well and leaves the skin well cleansed and soft but it doesn’t dry it out. It feels like a luxury using this in a shower, I really love this orangey scent, I just wish it was slightly bigger so it could last longer! What I love about it is that it comes in a big bottle (200ml) as opposed to some other natural toners which all come in small bottles of 100ml. I think the price is pretty good too (£10 per 100ml). Last but not least, I bought myself some new sun creams for my holiday and they are all SPF50 and really natural with no parabens and no citrus oils. I will be reviewing these separately after my holiday. So there you go. I did quite a bit of shopping recently, didn’t I? What have you bought?